Near the end of Lindsay’s three-week trip to Italy, I received a brief text that spoke volumes about how, even in the most stunning of locations, we can begin to feel adrift, anxious for something to root us to our own rhythm again–work, ritual, a familiar tea cup, a bedside table stacked with books waiting to be read. Of course, this restlessness can strike at any moment, even in the midst of the most peaceful day at home or the most hectic week at work. During times of great restlessness, I feel tempted to fill the questioning silence with easy, accessible noise to distract me from my soul’s discomfort. I have a rolodex of options: a purchase on Amazon, another hour at my computer, my favorite BBC shows, or my favorite extrovert option–planning a party or at least finding a friend for coffee. These are fine things in themselves (and I do throw a good party), but by forty, I know myself well enough to recognize my old tactics. And I must honestly ask myself: what is my spirit actually panting for? I find the response to my question in silence and listening, sometimes simply in the act of walking into the garden, falling on my knees, and weeding. I need places where I can be long enough to find what I need to take me through another day of living and loving the people and earth around me. Among the poppies and the clover and the roses, I find space to sort through all that clatters in my head. With my hands in soil, I grasp a few fundamental words that orient me to what is real. There is robust beauty there, and poems to be found, like this one I finally wrote down after weeks of carrying it about with me. spilling pink and orange watercolor across the city’s somber pallette. I thought of what a preacher told us. in Braveheart. Can you think of anything better? I think this world is a garden. unfolding fuchsia petals in rugged Nepalese mountains? they sing on every street corner. offering nectar to bees and hummingbirds. from the air, peach- and lavender-colored blooms. On others, I am quiet, an evergreen leaf, pearled by rain. and today I am content to hold the dew. P.S. We’d love to know what metaphors spring to mind as you think of this world we live and move in. As always, we are honored by all your thoughts and reflections as we share this journey into wonder together. PS2. To see Lindsay’s actual text from Italy, please check out the Back Page. Since moving to the Pacific Northwest, I have come to believe that nothing is better than “messing about in boats”–if those boats are kayaks. I love that first pull away from shore, the transformation of clumsy land mammal to gliding waterbird. Some months ago, I escaped the busyness of my life for a camp near Mt. Rainier. More than anything, I hungered to be out on the lake alone. I pushed out my kayak, paddled into deep water, and waited. For what? I think I wanted the lake to give me something, though I can’t tell you what it was. The lake did not fulfill my overly simple quest for “peace and quiet.” The wind stirred the trees, birds cried, my paddle dipped into the water. Inside my head, voices shouted and whispered and cajoled. Still, I waited, as I often do when I enter into a wild place, for some kind of gift, some kind of salvation. But as the saying goes, wherever you go, you are there. Even in the midst of that expansive beauty on the lake, I felt the margins of myself keenly. Again, I was the self-conscious human, standing outside, looking in. Small, limited, cosmically alone, I waited. I am–and you likely are, too–the man in Robert Frost’s poem, The Most of It, who stands at the edge of a lake and shouts. What does he hope for? A voice not his own, a voice to startle him out of his weary self. What does he receive, coming back over the water? An echo of his own voice. He thinks he keeps ‘the universe alone,’ and in this echo-chamber, there is no escape. What saves him, with sudden, unsettling crash, is a mighty buck that pushes the water and scrambles to shore, “pouring like a waterfall,” then ploughs through the underbrush–and is gone. What saved me that day out on the lake were the ospreys that circled high, crying, and then plunged down into the water to hook fish in their claws. I pulled my paddle and let myself glide, absorbed in watching the birds dive and call. For just a moment, the multitude of things that clamor for my attention died away in the stunning scene before me. This world shakes me from myself again and again. Some days, of course, my walls are simply too impenetrable. But I keep calling across the lake, waiting for that encounter with the Other. And all I have to do, most of the time, is show up. Whether it’s pushing out a kayak or simply stepping out on my back porch, this world so often rises up with is own startling presence. P.S. For a rather humorous behind-the-scenes glimpse of this week’s Consider, please visit The Back Page. P.P.S. We’d love to hear from you. Please enter the conversation–suggestions for further reading, counter-readings of Frost’s poem–on Facebook or on the comments form on our blog. Or drop us a line. It’s early summer and the roses are as wide as tea saucers. When I pass by the garden on the way into the house, their heady scent cloaks me. There are too many blooms to cut and bring inside, but the few I’ve arranged simply in vases astound me with their dense layers of petals. I am humbled by beauty like this; without a great deal of work from me, the garden yields new blossoms every morning. As I read Lindsay’s Consider this week, I felt humbled again by the realization that though majesty and wonder charge our world, many people can’t experience either. How fortunate I am to be able to feel something as I look at the roses. I am aware that my perception of beauty and enjoyment of this world is a gift, and a tenuous one at that. I think of the dear people I’ve known who have battled depression, of the powerlessness and despair they have tried to describe–a dulling of all senses, an inability to respond, to hear, to see. “It’s like being deep underwater, wrapped in chains,” a friend once told me. I can see glimmers of action, hear muted voices above me, but I can’t free myself to swim to the surface.” When this friend ended her life after a long battle with mental illness, someone told me that she believed some people were just not meant for this world. No. I can’t believe it. My convictions tell me otherwise; my faith that we are eternal beings made in the image of God instills a hope in me that, like Emily Dickinson’s bird with feathers, sang on even in the terrible, broken days that followed my friend’s death. And yet the ache. And yet the terrible irony that the people I love who have suffered most acutely from depression are people who, when they are well, are most sensitive to the goodness and beauty in the world. The injustice of it, the awful brokenness of it, makes me long for more than this world of dew. And yet. . . .
“We are made for this world. We are not made for this world.” Can both be true? I have never forgotten his words. In this early summer with the roses before me, I touch the sorrow that scars us all. I am made for this world, wholly and completely. With great humility, I say, Yes! to this world, and yet. . .And yet. I long for the Eternal Spring. Each Holy Hour is one month old! Like a newborn opening her eyes to the world, Kim and I are in a haze of astonishment at the response we’ve received. Your comments, shares, personal messages and feedback have meant a lot to us. Thank you for letting us into your lives. It is truly an honor to journey with you. This week, as I watch my kids near the close of another school year and anticipate the long, lazy days of summer ahead, I’ve been thinking about my own childhood. My hometown in coastal New England is a postcard of colonial clapboards and blue ocean. Through all sorts of weather and almost daily in the summer, my family made the short trek to Crane Beach, a glorious four-mile sand beach and estate. We’d park the car, freight ourselves with towels and pails, shovels and sunglasses, and amble over the dunes. On the far side of those shifting mounds, we’d find the closest thing to infinity I knew. The Atlantic. With a few sailboats tacking at the horizon, and (on clear days) Maine’s Mount Katahdin a hazy bump, it was an immensity so searingly beautiful, it was a hair’s-breadth from pain. The Atlantic nurtured all my budding devotional impulses. Like the Divine, it was unboundable, unknowable, and yet right here, spending itself on the sand, lapping my shins. Changeless yet always changing, it followed its own rhythms of waves and tides, a pattern as old as Earth. In my family, we were earnest Sunday-school attenders. While my friends zipped around bays and coves in bowriders, I spent Sundays in the pews of First Presbyterian. Often, on our hard benches, we traveled deep into questions of faith and meaning, casting lines from the bow through prayers and hymns, stories and practices. But the Atlantic preached another kind of sermon. Wordless in its exhortation, speechless in its exegesis, it made me feel the thing we mean when we say, “my heart leapt up.” Solemn elation, deep-fed joy, something at the far-border of my senses, stirred in me. “Exultation is the going/Of an inland soul to sea, —” writes Emily Dickinson. “Past the houses, past the headlands/ Into deep eternity!” As a child, I thought this poem was written for me. It seemed so intuitive to my experience, I felt proprietary regard for it. It bespoke the way the Atlantic pulled the tide of my heart toward something deeper. It suggested that all the human habitations – the propositional truths and earnest homiletics in which we usually trafficked – were just the beginning of the adventure. Beyond these headlands, deep eternity called. I’ve never gotten over that call. Every trip to Crane Beach ended with gathering up our pails and shovels, shaking sand from shoes, traipsing back over the boardwalk. We’d drive home and pack everything away, hang towels on the back porch. I’d brush my salt-tangled hair and arrange a few shells on my shelf, living in the afterimage of the blue, endless Atlantic, and waiting again for this inland soul to go to sea. p.s. On Friday, Kim will continue the conversation on our blog. Check it out and leave us your thoughts. p.p.s. 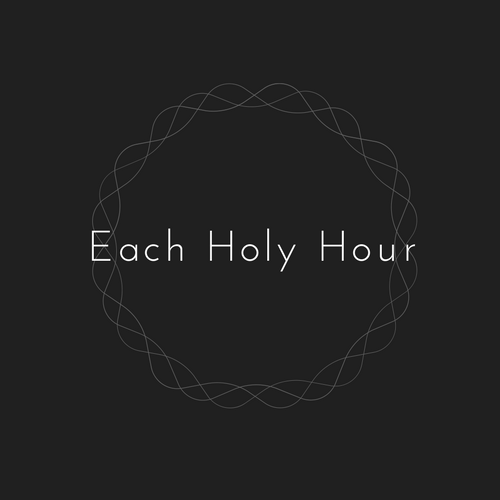 We’ve launched a new page on eachholyhour.com. The Back Page is our way to honor the messiness of providing thoughtful content. It chronicles some of the behind-the-scenes pitfalls and levity we bring to this work. Chris Maynard Creates Art with feathers. Wonder! Gordon Hempton's recordings of the Hoh Rain Forest: "One Square Inch of Silence"
Environmental Activist & Author Joanna Macy reads Rilke's poem "Go to the Limits of Your Longing"
Mary Oliver reads her poem "I Happened to Be Standing"
Poet Naomi Shihab Nye Reads "So Much Happiness" and "Kindness"
T.S. 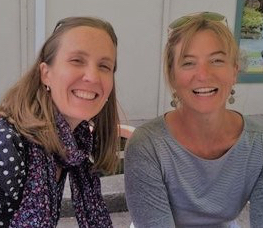 Eliot's "The Four Quartets"
Irish Poet and Philosopher John O Donohue on "The Inner Landscape of Beauty"
Keats' Letter: "The Vale of Soul-Making"
Kim and Lindsay are writers who share a heart for community, discovery, and contemplation.